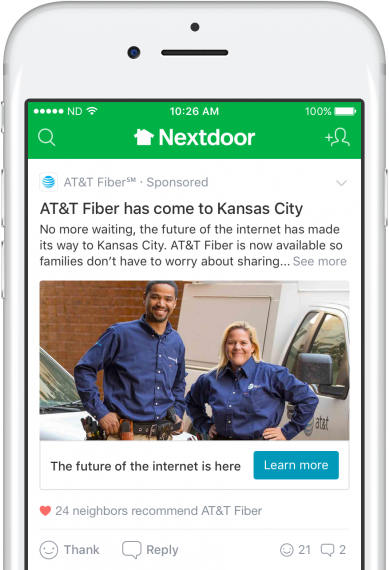 Advertise on Nextdoor to help your business become trusted with neighbors talking about home, family, and community. When Nextdoor members need recommendations for products and services, they rely on a trusted source—their neighbors. With Sponsored Posts, businesses connect directly with local communities. New to Nextdoor? Nice to meet you! Nextdoor is the private social network for you, your neighbors, and your community. Over 90% of US neighborhoods use Nextdoor to get recommendations, help find lost pets, receive safety alerts, and much more. Ready to join the conversation with Sponsored Posts? Become a trusted name when Nextdoor members discuss local products and services.